While visiting a local antique shop recently, I discovered an interesting brochure titled, “Lynchburg’s First 200 Years: Fifty Fabulous Facts.” Illustrated with beautiful pencil sketches by local artist Jon Roark, the pamphlet was created for Lynchburg’s bicentennial celebration in 1986. It presents an engaging survey of the great highlights of local history, compiled at a time of very public reflection on our community’s past. It includes the usual trivia, like Lynchburg’s stint as the capital of Virginia for four days in 1865, as well as more obscure facts, like the invention of the first modern fire hydrant by Wiley|Wilson founder Edgar C. Wiley. As someone who has studied local African American history for many years, I was especially interested in what “minority” facts were considered noteworthy in 1986. I was surprised to find that only two out of fifty could be categorized as “black history.” The first referred to Frederick Douglass and Booker T. Washington giving speeches at Jackson Street Methodist Church, and the second was about published Harlem Renaissance poet Anne Spencer. Compared to similar publications produced during the Sesquicentennial in 1936, this brochure signaled a radical—and welcome—change in what constituted “public history” in Lynchburg. It was an important early step in the reevaluation of local history that continues to this day. 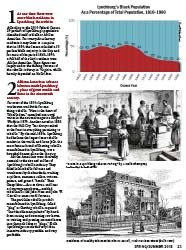 Thanks to a multi-front effort to focus on these elusive facets of local history, it would be easy to fill a pamphlet with fifty black history facts alone. Major advances in digital history and genealogy, which were only possible with the Internet, have made vast archives of “new” historical data available to historians. 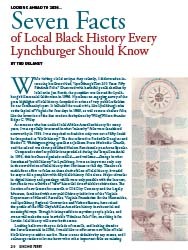 The creation of new centers for research at Old City Cemetery and the Legacy Museum, combined with new public history initiatives of the Virginia Department of Historic Resources, Virginia Foundation for the Humanities, and Lynchburg Regional Convention and Visitors Bureau, have raised the profile of the Hill City’s African American history in substantial and meaningful ways. Though it is impossible to say what people, places, and events will make the next inevitable “Fabulous Facts” list, one thing is for certain: local history will never be the same. Looking back over the past decade of research, and looking ahead to the Sestercentennial in 2036, I would like to offer seven new facts of local black history to add to our list. These are not definitive by any means, and I encourage readers to let me know what other important facts are missing. Ted Delaney is the Assistant Director of the Old City Cemetery Museums & Arboretum in Lynchburg. He is a graduate of E. C. Glass High School and the University of Virginia. He has written, lectured, and consulted extensively about local history and genealogy. Delaney is the co-author of Free Blacks of Lynchburg, Virginia, 1805-1865.